Golfers often utter the phrase “green light” when conditions look perfect for going straight at the pin. But thanks to new light therapy technology, it’s time to slip the words “red light” into the golf conversation — in a good, healthy way. A company called Joovv has created an affordable home-use device uses high-powered LEDs to emit red and near infrared wavelengths through your skin. Clinical studies show that light therapy naturally aids the body in recovery and healing, sports therapists, athletes, and doctors are using it to treat muscle, fatigue, bone and joint injuries, arthritis, and a lot more. The Joovv Light hangs on the back of any door and delivers a safe, clinically significant dose of light energy in just five minutes a day. The best part? The entry-level Joovv Light starts at $495. UFC fighters, former Crossfit champions, and professional baseball players already incorporate the Joovv Light into their daily regimen, and it’s a perfect solution for golfers struggling with everything from run-of-the-mill muscle aches and strains — through repeated motion, overcompensation, aging, whatever — and looking for relief beyond the temporary (over-the-counter pills) or out-of-reach expensive (periodic trips to a high-end rehab facility, for instance). “Light therapy has been used for years to treat an array of medical conditions and diseases, from skin conditions like psoriasis to seasonal affective disorder (SAD) and depression and most of these studies have focused on broad-spectrum and UV light — the “shortest” types of light waves. But it’s only been more recently that scientists have begun studying the effects of light waves at the other end of the spectrum — red and near infrared (NIR) waves. Like UV waves, red and near infrared waves can penetrate the skin — triggering chemical and other physiological actions deep inside the tissues. And now, medical researchers are beginning to realize how important those mechanisms can be in promoting good health, specifically for the repair of damaged tissues. “One of the primary ways light therapy helps promote better muscle health and function is by preventing or limiting muscle fatigue, which naturally occurs as a result of physical activity — especially strenuous exercise and training (and yes, golf can be strenuous). 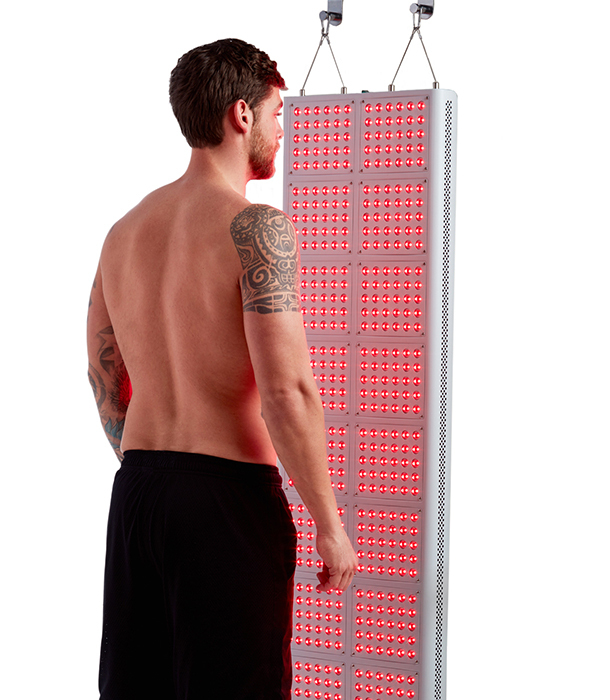 In fact, research shows red and infrared light therapy is effective in preventing muscle fatigue and enhancing skeletal muscle performance. Few toxins, healthier skin and muscles, more strength, more energy — all are in view when it comes to using red light for quicker muscle recovery and overall health. And that means a green light for more golf … with a heckuva lot less pain.